GlideTV Navigator is the latest entrant into the HTPC, over-the-top video remote control space. And, after several days with a review unit, two things have surprised me… in a very positive way. First off, I experienced none of the touchpad lag or jerkiness I’ve previously encountered using similar solutions such as the Zeevee box remote. And, in addition to typical finger tip control that you’d find on a laptop, GlideTV offers an optional ‘absolute’ mode where the touchpad represents your display: Touch the upper left of the sensor and your arrow/prompt/cursor appears in the upper left. Tap the center, see the cursor in the center. Etc. The touchpad itself, like the ones found in current Macbooks, is also clickable. Plus, it’s surrounded by an additional eight physical buttons. Without a doubt, this is the best remote touchpad I’ve used. Secondly, after seeing the initial GlideTV press imagery, I was a bit skeptical of another two-handed remote. I want to efficiently control my devices without looking down, which is why I’ve never been a fan of tablet style touch screen solutions. But after a few days of use, I’m (partially) operating the GlideTV Navigator with one hand. And strangely, considering I’m right-handed, I’ve been using the remote in my left hand. It does require a certain amount of precision (and hopefully a 10′ UI with large buttons), but I’ve been trained well as a Call of Duty sniper. The sculpted unit, with backlit buttons, is attractive — as is the matching charging base station. The RF USB receiver isn’t much to look at, but you’d most likely hang it off the back of your device. Speaking of which, Windows, Mac OS X, and the PS3 are supported. Although, your best bet is running Windows to utilize their web launchpad (shown up top) and virtual keyboard functionality (in the gallery below). (At least until the Alpha Mac software is made available in the next few weeks.) In lieu of their Java webtop, I preferred running Firefox on Windows in fullscreen/kiosk mode, having installed their FF plugin which facilitates text entry, to best enjoy web video. Of course, you can also control things like Boxee, Front Row, and SageTV* without using any GlideTV software at all. What I can’t tell you is if the GlideTV Navigator is worth $150. Despite it’s solid performance and good looks (including beautiful packaging), one fifty seems a bit steep. (50% the cost of a PS3 you could be attaching it to. Or 75% of the cost of an iPod Touch which will run multiple virtual remotes.) Also, as anyone who maintains a HTPC will tell you, you can’t count of software devs to standardize on keyboard commands – which is ultimately how GlideTV interfaces with your computer using the standard HID protocol. From a consumer perspective, ignoring Glide’s need to profit, I’d prefer to see this product sold for $99. And see a higher-end unit, with tucked away QWERTY keyboard or even numeric keypad, occupying the $150 spot. Interesting SageTV footnote. I noticed the name of Sage’s CEO in GlideTV’s press materials. Mike Machado is obviously the skilled multi-tasker. And is perhaps hedging his bets. And I just realized here at the Kinkos why I can ‘mouse’ by holding the Navigator with one hand and using my thumb. That’s how I frequently (as in now) operate my iPhone (when typing short responses I hold it with my left hand and use my right index finger to peck at the virtual keys). Is this a TV remote? Why are you watching television on a laptop/notebook? 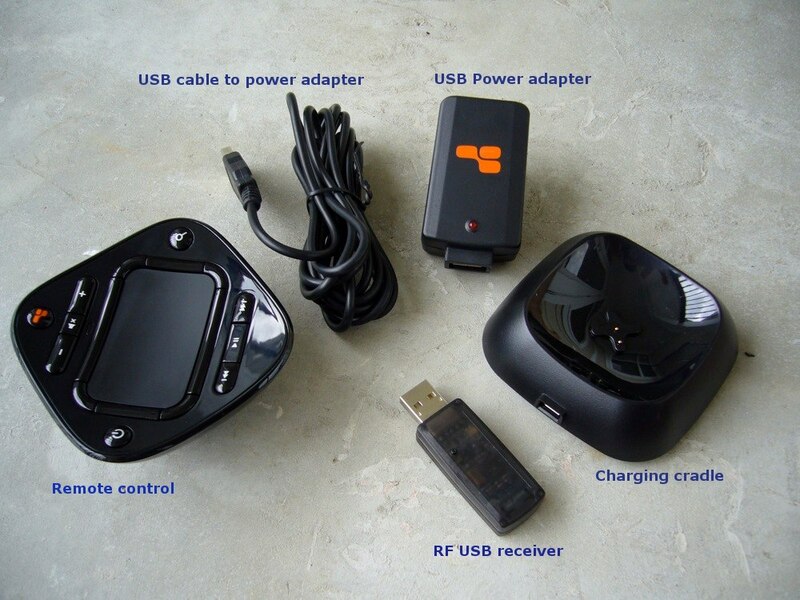 This is a remote for home theater computers (HTPC) or PS3s. You’d use it with something that has a larger screen than that 13″ Macbook (my HTPC used to power a projector with 10′ screen), but the top pic does nicely show their custom application, the Navigator, and the USB RF receiver in a single frame. Oh. What is the gizmo with the 3 orange squares on it? Dang, I’ve been juggling 4 remote since my wife usurped my Logitech Harmony for her TV/DVD/TiVo upstairs. This would of been super sweet to have. If you like that Touchpad wait to you play with the upcoming Dish Network 922 receiver. Scott, I have played with it. It’s OK, but the location of the button/trigger underneath required me to use two hands. Also, with a typical STB (versus more complex computer UI) one shouldn’t need a touchpad. I’d prefer to see the 922 with a standard four/five-way or even a trackball if they wanted to get clever. It’s bad move for a device designed for the mainstream – my mom, for example, wouldn’t/couldn’t use it. Have if you heard if they’ll offer a standard remote option, too? @Travis…The large one appears to a be the box that it comes in, the smaller one is the transmitter that plugs into the computer. It is also fully functional as a regular mouse, correct? I need something to help browse the web while lounging on my couch in front of my TV. What’s the software that’s running in the first snapshot? Best remote touchpad??? Have you used the Logitec Dinovo mini? I’d be curious how it compared to this. Anonymous, yeah you can use the touchpad and buttons like a regular mouse. Q-bert, GlideTV provides Windows software (Java) that essentially provides a 10′ interface to your web browser in aggregating top video sites and facilitating search. In addition to that virtual keyboard UI. It looks pretty nice and works fine as a launchpad, but is optional. tony, I’ve never lived with it, but I’ve used it on a few occasions (including CES 2008 where it was introduced). For this post I was mainly thinking traditional remotes. 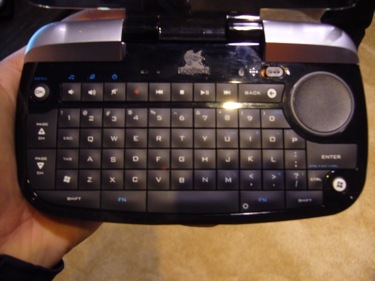 Of course, this blows traditional out of the water in terms of form and us HTPC users do appreciate a QWERTY keyboard. So I’m happy Logitech provides one, although connectivity can be squirrely. But, because the touchpad is very small (and round) it probably requires more precision than the the larger, rectangular GlideTV. Additionally, like a typical laptop, with GlideTV touchpad you can scroll by dragging your finger along the edges which is appreciated. On the other hand, the Dinovo touchpad can also be used as a five way controller. I use it exclusively for my HTPC – Vista Ultimate Media Center + web browsing. I am not sure what connectivity issues Dave is talking about (I’ve had none), but touchpad is far from perfect on it. Having said all that, I’d still take DiNovo Mini over that in a heartbeat for an all-purpose HTPC. Navigator may be fine for media playback, but I’d find lack of a keyboard frustrating for browsing and managing the computer — I speak from experience as I originally tried to use only a wireless mouse for HTPC and that grew old very, very quickly, so I bought DiNovo Mini even though I still find it to be too expensive. Agreed, I’ve always had a wireless keyboard of some sort around in one form or another. The one I used most was a very compact RF model from Gyration. I use the RF Gyration Keyboard and Air Mouse combo to control HTPCs and/or the iPod Touch (WiFi) with a couple of remote control apps, one free and another costs 99¢. Between these two hardware solutions I’m good to go. I use these same solutions for my HTPC customers.